WRENTHAM, Mass. – A good offense needs ball and player movement to keep the defense guessing and someone that can get the ball into the hands of open shooters. Even when all of that goes right and the offense creates a clean look, in the end someone needs to knock down the shots. 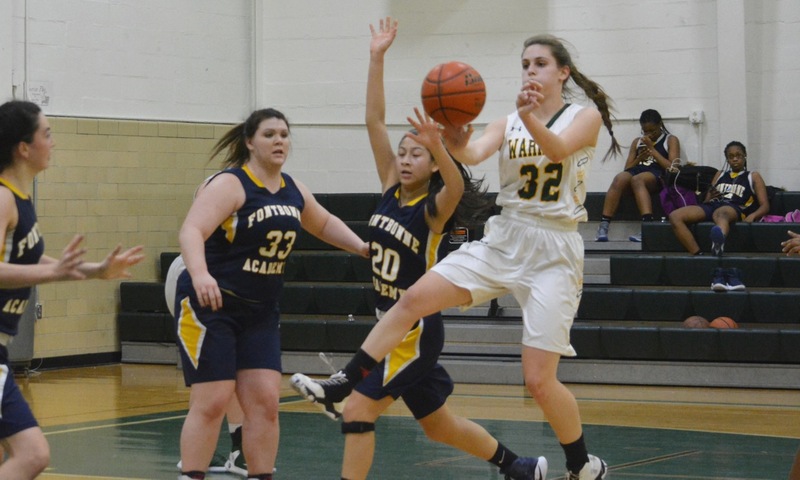 It was the last part that King Philip struggled with on Wednesday night in a non-league game at home against Fontbonne Academy (Milton). KP moved the ball around the perimeter, drove into the lane to draw defenders, and had its fair share of open shots, but unfortunately for the Warriors few found the bottom of the net. Fontbonne went on a 32-13 run over the second and third quarters to break the game open and had three players reach double figures in points (two of whom also had double digit rebounds) to pull out a 59-38 victory. Offense was a struggle right from the opening tip, which Fontbonne won and turned into a lay-up for Arienne Sauvignon Howard (team-high 17 points). KP worked the ball around and found open players but shots just would not fall. The Warriors hung around with a tenacious full-court press and aggressive half-court defense in the first. Shannon O’Connor (eight points) had a steal and layup to get KP on the board and then freshman Chloe Layne got to the basket for the first of her six points. Julia Leroux (six points) scored on a spinning drive and then freshman Faye Vellieux snagged an offensive rebound and assisted on a basket by Catherine Cummings before adding a basket of her own on another put-back just before the quarter ended. KP went into the second leading 10-9, but Fontbonne would start to impose itself on the glass and find ways to break the KP press. Freshman Tasha Lima (11 rebounds) used her quickness to score seven of her nine points in the quarter and Annabelle Larnard (13 points, 15 rebounds) tallied a three-point play as the Ducks went into halftime leading 26-18. Things did not get better for the Warriors in the third quarter. After an O’Connor pull-up jumper, Fontbonne went on another long run, this time 12-0, and pushed its lead to 41-20. Layne scored at the buzzer with a baseline scoop but the Warriors had been outscored 15-5 in the quarter and trailed by 18 points heading to the fourth. The Warriors have only one senior on the roster, Courtney Kelleher, and start a freshman and two sophomores. Struggling like they were on Wednesday, they could have hung their heads but KP continued to compete throughout the fourth quarter. The Warriors just could not deal with the Ducks on the glass, continually giving up second and sometimes third chances. “We weren’t knocking down shots and we weren’t getting many rebounds and if you’re not doing that then you’re not going to win too many games,” Crowley admitted. Layne started the quarter with another drive to the rim and then Faith Roy (eight points) chipped in with an offensive rebound for a basket and knocked down KP’s only three of the night to cut the Fontbonne lead to 15. It was as close as the Warriors would get. King Philip (5-10, 3-9) will get back into Hockomock League play on Friday when it hosts Taunton. SMITHFIELD, R.I. – Early in the second half of Thursday night’s finale of the 30th annual Rhode Island Girls Basketball Holiday Tournament, Ponaganset guard Jillian DelPrete hit back-to-back runners to put the Chieftains ahead 23-22 and force King Philip to call a timeout. After the timeout, KP settled down and the Warriors defense clamped down. Ponaganset was held to only eight points over the final 12 minutes of the game. Senior Courtney Kelleher scored all 10 of her points in the second half and also pulled in 14 rebounds on the night, while sophomore guard Shannon O’Connor scored 14 points and dished out five assists to help the Warriors pull away for a 49-31 win and the tournament title. It did not start well for the Warriors, who came out flat and fell behind by as many as seven points in the first half. DelPrete (team-high 13 points) buried a three to make it 11-4, but KP responded with a 6-0 run to close the gap. O’Connor scored four of those points and Catherine Cummings (seven rebounds) grabbed an offensive board and put-back. Trailing again by five, KP took control of the game with an 11-0 run. Julia Leroux (seven points) collected a lobbed pass from Faith Roy for a layup to get it started then O’Connor hit Roy for quick-release jumper to make it 16-15 and give KP the lead for the first time. Leroux assisted on a jumper by freshman Sophia McLaughlin and the Warriors went into the break leading 22-19. “We were a little flat coming out but we closed the half strong and one of our goals was to keep them under 20 points for the half and in the second half we were even better defensively,” said Crowley. O’Connor hit a pair of free throws to give KP back the lead at 24-23 then Roy hit her second jumper. That was when Kelleher started to assert herself on the boards and on the scoreboard. She scored on an offensive rebound then off an assist by Roy. Another put-back and another layup, this time on an assist by O’Connor, provided some separation between the teams. While Kelleher was controlling the paint (she also had three blocks), O’Connor was controlling the point guard position, especially after Leroux fouled out late in the second half. O’Connor continually got into the lane and had the vision to drop passes off to her teammates, including twice to Christina Hathaway as the Warriors put the game away down the stretch. KP was able to rotate players down the stretch and got buckets from Kendall Mason and Grace Ely (off an assist by Faye Vellieux), as the closing minutes ended up being comfortable with a double-digit lead. 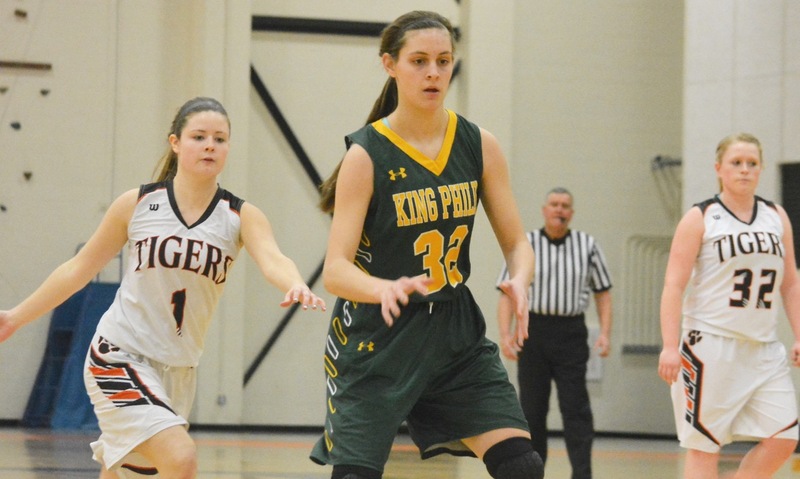 King Philip (4-1) will get back into league play on Jan. 6 against unbeaten Attleboro. Taunton, 65 vs. Hope (RI), 39 – Final – Sophomore Tyler Medeiros scored a team-high 13 points to pace a balanced attack for Taunton. Senior Jose Mercado and junior Tommy MacLean each chipped in with 12 points in the win for the Tigers. 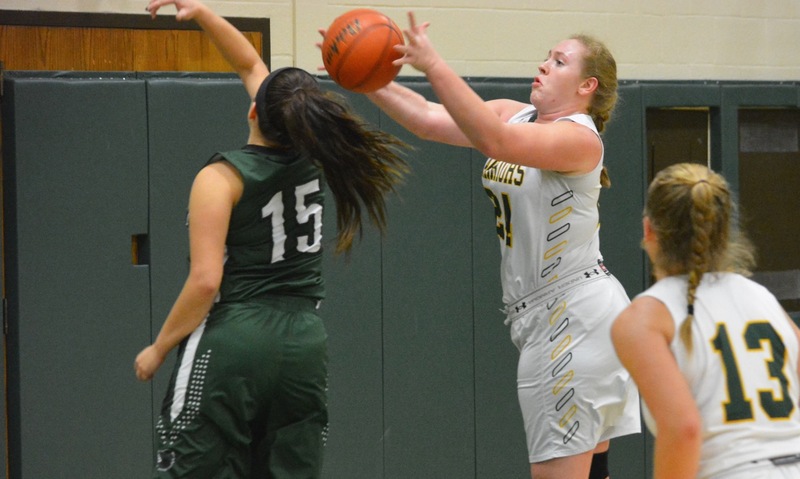 King Philip, 57 vs. Cumberland, 44 – Final – Rylie Dalzell scored 11 of her team-high 15 points in the second as the Warriors outscored Cumberland 21-8 over the final eight minutes. Julia Leroux added 10 points, Shannon O’Connor and Maddie Purdue each chipped in with nine points and head coach Marty Crowley said Courtney Kelleher played a big role off the bench. Marshfield Tournament (Mansfield, North Attleboro, Oliver Ames, Sharon) – After one day of competition, North Attleboro is sitting in first with 138 points. Sharon is currently in 5th with 85, Oliver Ames is in 17th with 58 points and Mansfield is in 32nd with 24 points. North Attleboro has eight wrestlers that have advanced to the semifinals while Sharon has five grapplers in the semi finals. 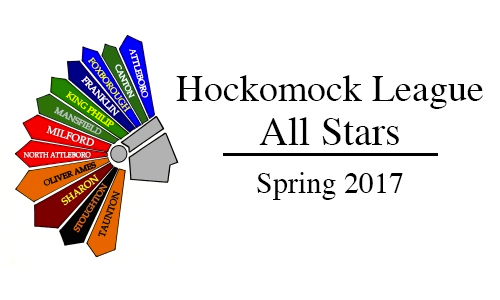 The list includes Sharon’s Yosef Ellis-Rech (113), Luke Stillman (132), David Ellis-Rech (138), Tyler Jensen (145) and Jason Powell (152) and North Attleboro’s Devin Spratt (120), Alex Devitto (126), Mike Gould (138), Nick Gould (145), Colin Fiske (152), Jack Donahue (170), Leo Thibeault (220) and Brennan Sankey (285).